FOXBORO, Mass. — The Packers got a fourth-quarter TD pass from rookie QB Brett Hundley and defeated the Patriots, 22-11, in the preseason opener Thursday night at Gillette Stadium. The Patriots began the fourth quarter trailing 15-11, nearing scoring territory early in the period, and QB Jimmy Garoppolo appeared to scramble for a first down on fourth down. But the Packers challenged the spot of the ball and won, with Garoppolo ruled a yard short, giving the ball back to Green Bay. Hundley responded with a 31-yard pass to WR Larry Pinkard, giving Green Bay a chance to add to its lead. 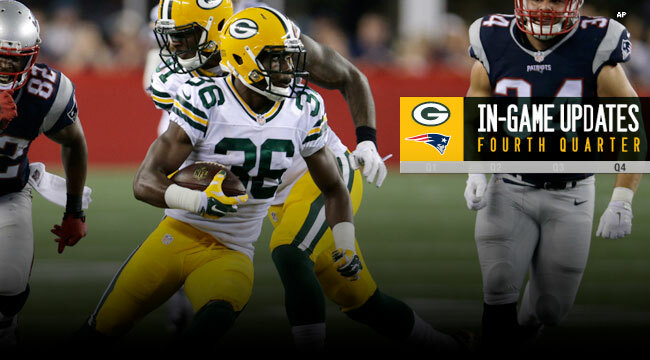 A roughing-the-passer call on the Patriots on third down moved the Packers to the 13-yard line, and three plays later Hundley found rookie RB John Crockett in the flat for a 10-yard touchdown. K Mason Crosby was good on the new longer PAT, giving the Packers a 22-11 lead with 7:42 left. The Green Bay defense continued to stand tall, as rookie LBs Jermauria Rasco and Jake Ryan each got sacks in a span of three plays to stop another New England drive. The Packers drove into scoring position one more time, this time with Matt Blanchard at QB. A facemask penalty on the Patriots wiped out a third-down sack of Blanchard, and RBs Crockett and Alonzo Harris moved the ball to the 14-yard line at the 2-minute warning. Crockett ran two more times for a first down at the 5, but the Packers took a knee to end the game.